After some struggling Amibroker I was able to create the translation for the MSR indicator introduced by David Varadi. The code uses the QDMedian3() function for Amibroker, that can be download here. 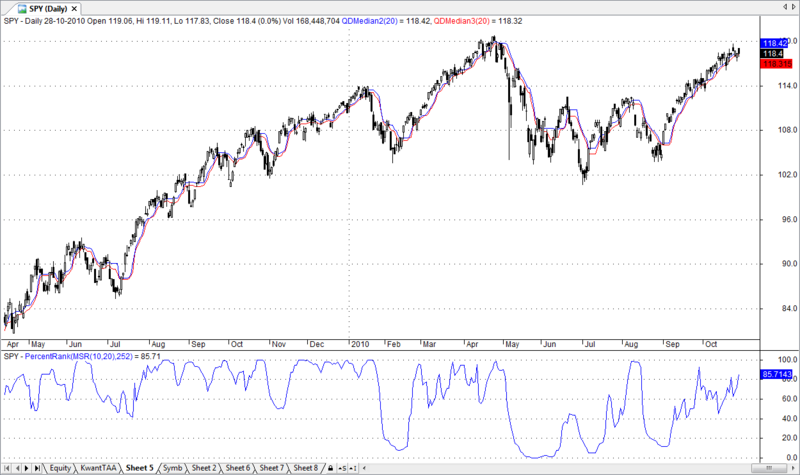 During the weekend I will post the system analysis for my ETF’s based on the MSR system. With the QDMedian code, this is a great contribution. Thanks! One possible improvement (I might have this wrong as I am not an AB user): since for any day H C and L are partially ordered (H >= C >= L), Max(H, C, L) is the same as H, and the same is true over a period, so in your code Max3 = HHV(H, period2), and there is no need to calculate the highest C and highest L.
Will adjust this in the my personal files. I’m new to the #include call. I think I’m suppose to point it to the dll plugin??? If that’s correct, I keep getting a syntax error on that line. Can some one please give me some clarity on this part of the code? Mike, #include call points towards an other amibroker formula file. This is a specific file containing additional functions and it is used to avoid writing the same functions over and over in each new strategy. Look into Amibroker helpfile for more information. Thanks. I get the call, but I did a search in Ami help on my c drive and google for the file Additional functions.afl. The hits I got were your blog. I am guessing this file and boiler plate are your personal creation? Am I way out in left field? Can I impose a little more and ask for further assistance? I don’t know how to make AB see this file, line as it is posted errors out for me. I downloaded the VC++ 2005 libraries too. DO you still intend to post the MSR with various ETF’s system? Hi Aristotle, yes I still plan to write a post about that. Last days have been occupied by finding a solution for the dll problem some of the readers were facing.